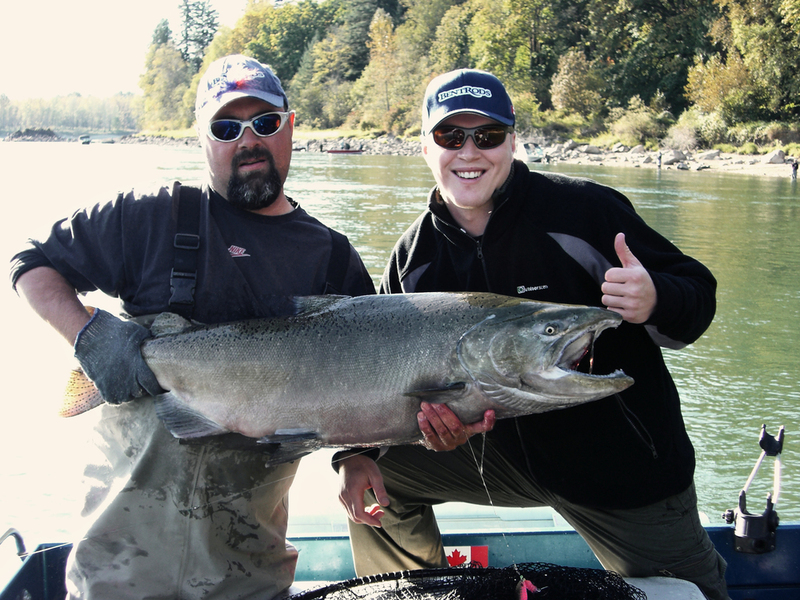 Chinook Salmon Guided Trips — Bent Rods Guiding & Fishing Co.
Chinook Salmon are known by various names, in British Columbia they are called “ Springs”, “Blackmouth”, “Nooks” or when reaching thirty plus pounds “Tyee”. In the United States and often other parts of the world, they are referred to as “Kings”, a most fitting name that describes their large size and great sporting qualities. While in the ocean, Chinook Salmon are the most sought after of the Salmon, and for good reason. The Chinook Salmon is a fantastic sport fish, their aggressive nature makes them responsive to a plethora of angling techniques and the battle that ensues is the stuff of legend. Add to this that Chinook are without a doubt the most delicious of the salmon; with large fatty deposits they are both tasty and full of flavor long into their return to the rivers. At Bent Rods guiding we concentrate our Chinook efforts in the Fraser River, Harrison River and a number of valley tributaries which enjoy strong runs of these great fish. We employ a whole array of techniques, as different times of the season call for different approaches to catch these amazing fish. Early in the season we will often use techniques that concentrate on anchoring our boats in known travel lanes and setting out action style lures such as spin n glos and kwikfish, often in conjunction with bait, other days we like to back troll down the river in attempt to locate the migrating salmon. As the season progresses we are constantly changing tactics to keep our clients catching Chinooks, we will use a variety of techniques such as anchoring with large spinners, wobbling spoons, plugs of all manner and other more active techniques such as back bouncing bait, hover fishing bait and casting spinners and spoons to holding Salmon as they stage at river mouths. Some instances can even allow for Chinook to be targeted using two handed fly rods and our custom tied Chinook flies. The great sporting qualities of the Chinook allow for a vast array of methods to catch them and this alone makes them one of our favorite fish to pursue. Our season starts in early to late June, mostly depending on fish availability and timing of the yearly spring freshet. As the run off from snow melt makes the river both high and dirty, we prefer to wait for a little less turbid water and floating debris, before we target these Salmon. We are constantly on the river searching for Chinook, so please give us a call in the early season and we can help you plan your Chinook fishing adventure. 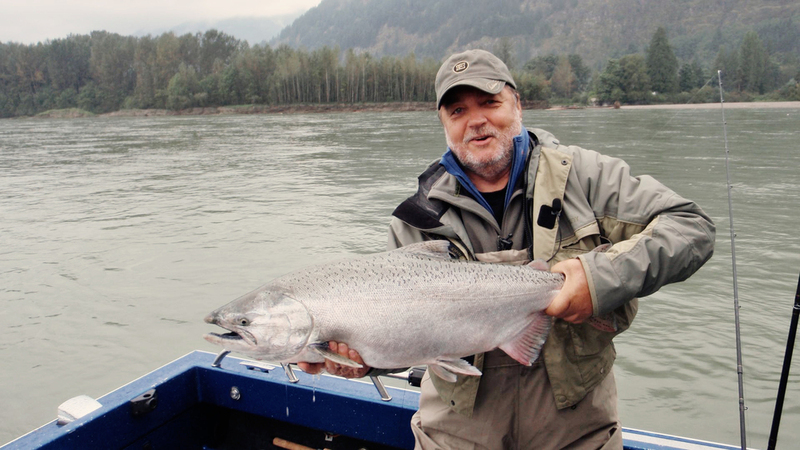 As the season progresses many runs of Chinook from various rivers travel up the Fraser. We will continue to pursue the red fleshed interior Chinook well into September and late runs of these fish have been very strong in recent years and some fantastic days are had by our anglers. The later running Chinooks can often be of quite mixed stocks and both red and white fleshed varieties are encountered. 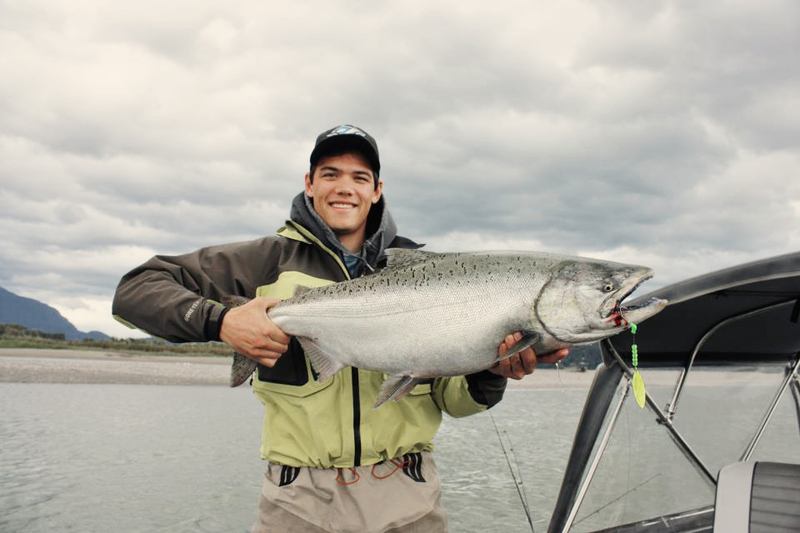 As September arrives we also begin to see the arrival of Harrison “WHITE” Chinook, these great beasts are both aggressive and LARGE, and huge specimens are caught by our clients every season. 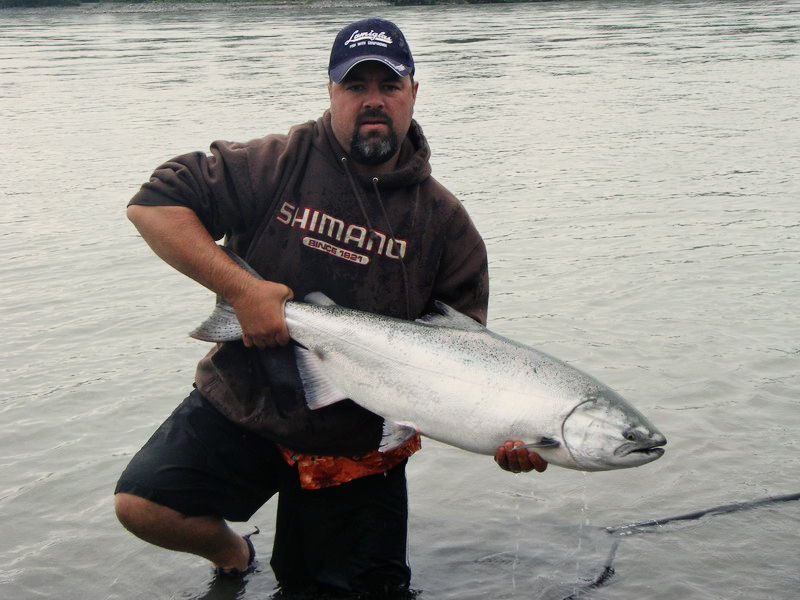 Our personal best Chinooks of around 65 pounds were both caught in the fall of 2006 and we feel this season will see a lucky angler break this mark, as our records indicate that this season will be a very good one, based on the parent run of this year. The Chinook salmon of the Fraser system are as varied in appearance as they are in timing and as such we enjoy a long season of fantastic fishing for very diverse and unique strains of fish.